Baffle's Code Room is the headquarters of Baffle in Donkey Kong Country 3: Dixie Kong's Double Trouble!. It is located along the west side of KAOS Kore. 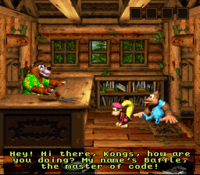 In the original Super Nintendo version of Donkey Kong Country 3, Baffle's Code Room resembled every other Brothers Bear's log cabin, but with a small bookshelf with books in it, presumably related to clue solving. In the Game Boy Advance remake, the location was entirely overhauled and remodeled after a detective's office. It has a red lamp shining in the direction of Dixie and Kiddy Kong, a chair for Baffle's visitors to sit on, and two unidentifiable drawings behind him. One of the drawings shows an object spreading outward in a few directions. When Dixie Kong and Kiddy Kong visit Baffle's Code Room, Baffle will explain to them that he is having trouble figuring out a code he's gotten a hold of. In order for Baffle to decipher the code, the Kongs must bring him the Mirror. With it, Baffle will be able to read the code, which, if followed, will lead the Kongs to Sewer Stockpile. Baffle struggles to solve a code. Baffle deciphers the code's message. Baffle wears a detective outfit in the Game Boy Advance version. Baffle speaks in reverse in the Game Boy Advance version. If a player already has prior knowledge of Baffle's secret, they can use this information without ever entering Baffle's Code Room and giving him the Mirror. The same logic can be applied to Blunder at Blunder's Booth.